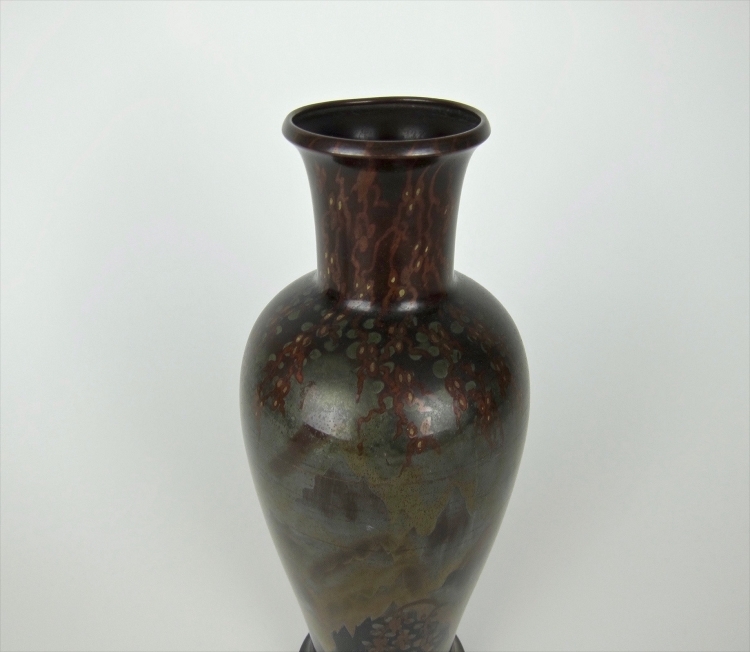 Very Good Condtion, Measuring 5.75 in. Dia. An important, artistic metal vase from the NKA Ikora workshop of WMF AG (WÃ¼rttembergische Metallwarenfabrik) of Geislingen, Germany. 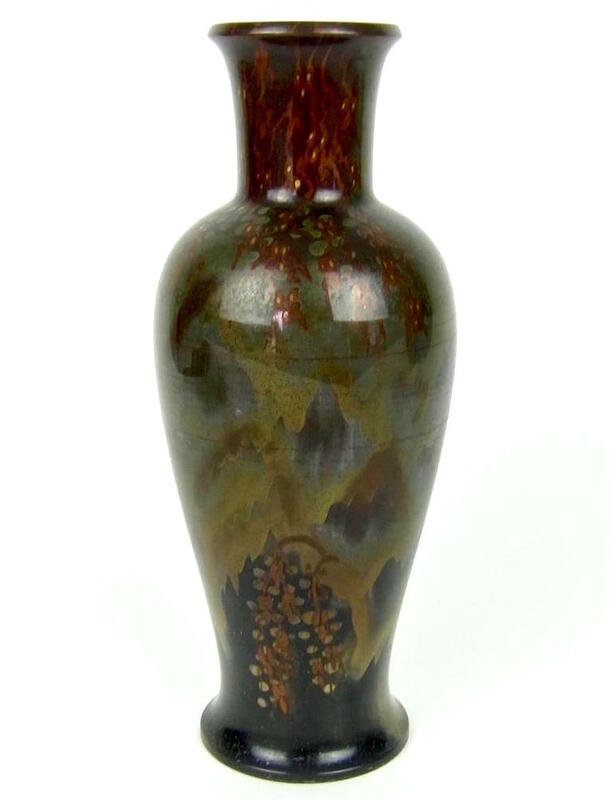 The vase was produced during the Art Deco period, circa 1925, was included in WMF "Ikora's noble metal and breuhaus wares" catalogue in 1929, and is illustrated on page 108, fig. 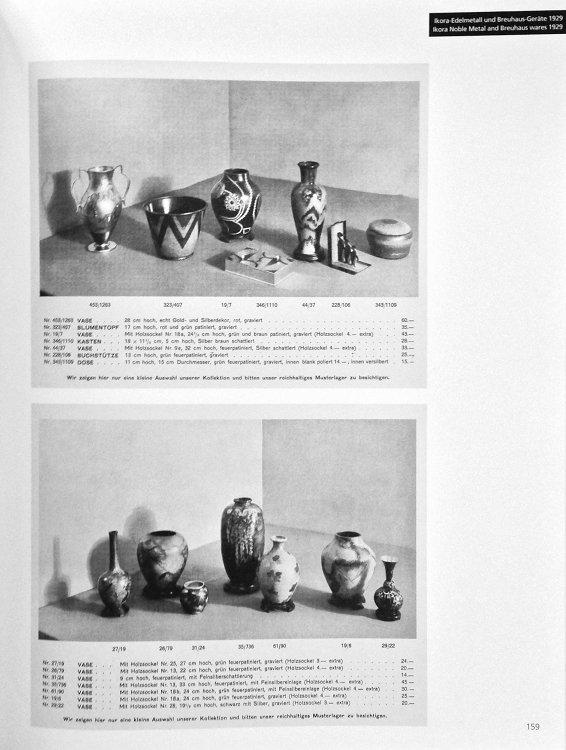 48 of Dr. Carlo Burschel & Heinz Scheiffele's WMF Ikora metalwork from the 1920s to the 1960s, published in 2006. 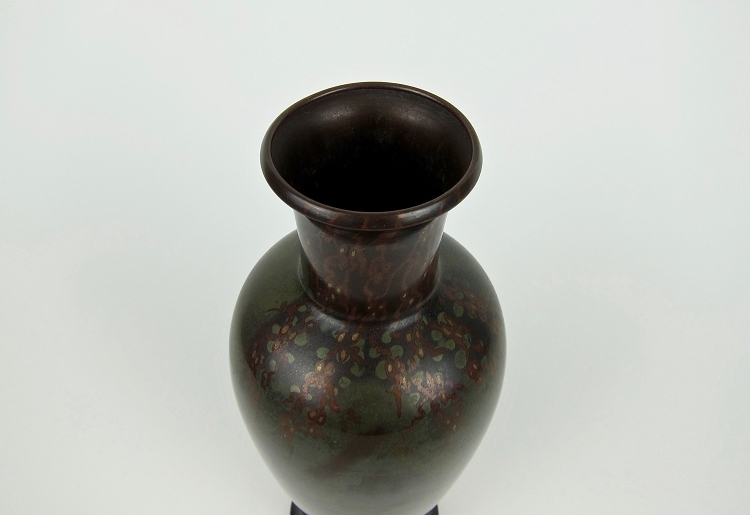 The vase was photographed in 1925 for the inaugural collection of products offered by WMF AGâ€™s Neue Kunstgewerbliche Abteilung (NKA) applied arts division under general director, Hugo Debach. 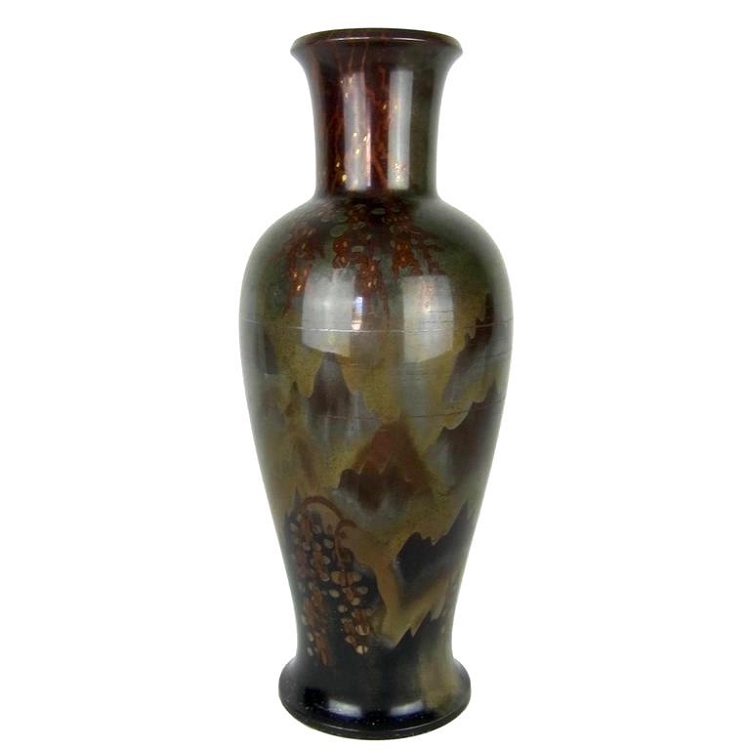 It was offered for just one year, appearing in the 1929 Ikora noble metal and Breuhaus wares catalogue. 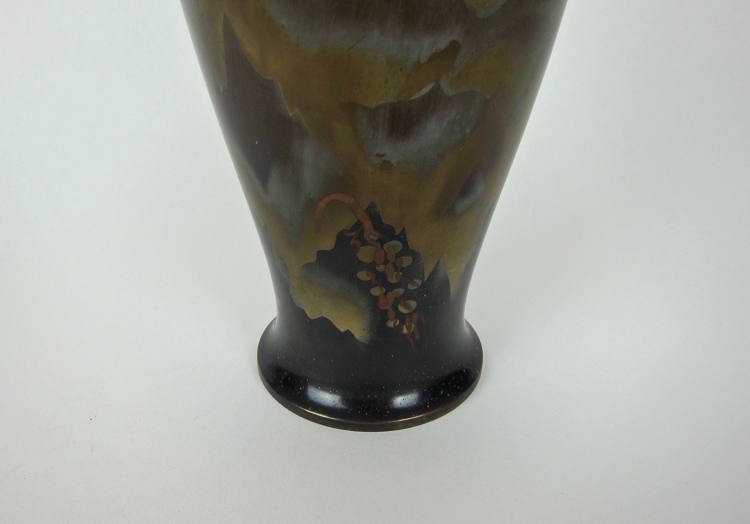 The division's work focused on innovative production and decorative techniques, crafting elaborately finished products designed by notable artists of the period, including Paul Haustein, Richard Riemerschmid, Rudolf Rieger, and Fritz August Breuhaus de Groot. 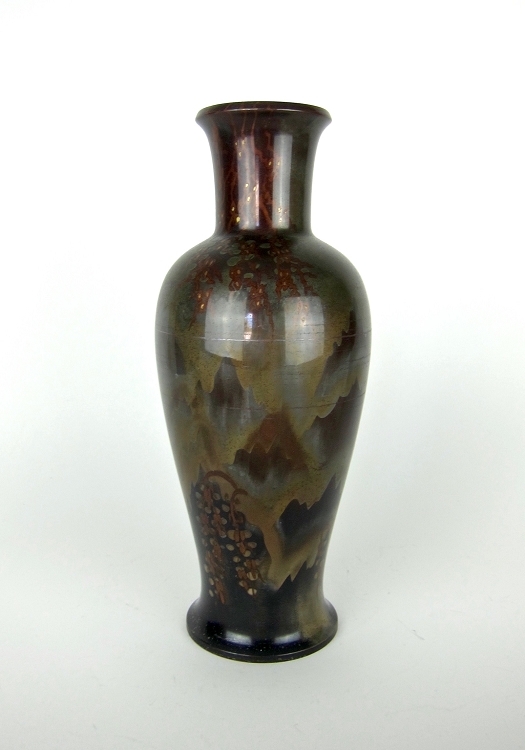 The highly detailed decoration consists of abstracted stenciled and shaded mountains in shades of gold, brown, silver and olive green against a black ground. Colorful trailing vines accent the top and bottom. 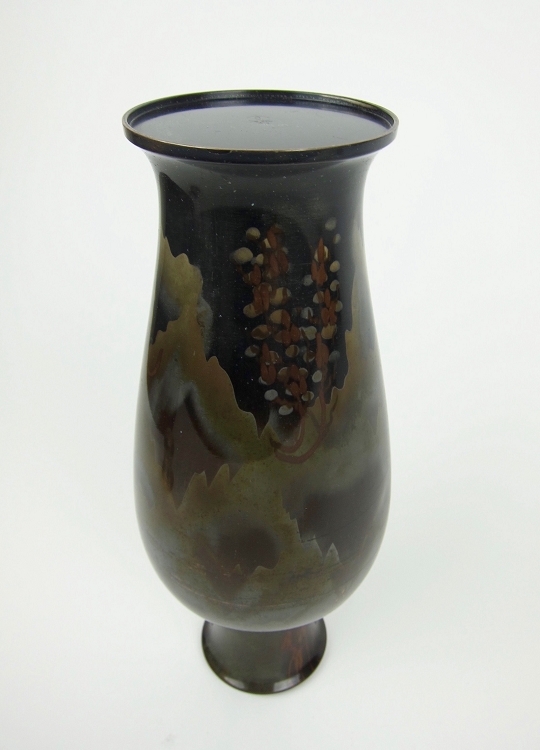 According to Burschel & Scheiffele, this vase was decorated with the following processes: "coppered brass with reddish-yellow fire patina, silvered, persulphate black finish, stencil-shaded, partly milled on a brass ground." The vase measures 11.5 in. H. and is WMF'S Form 44 / decoration 37. 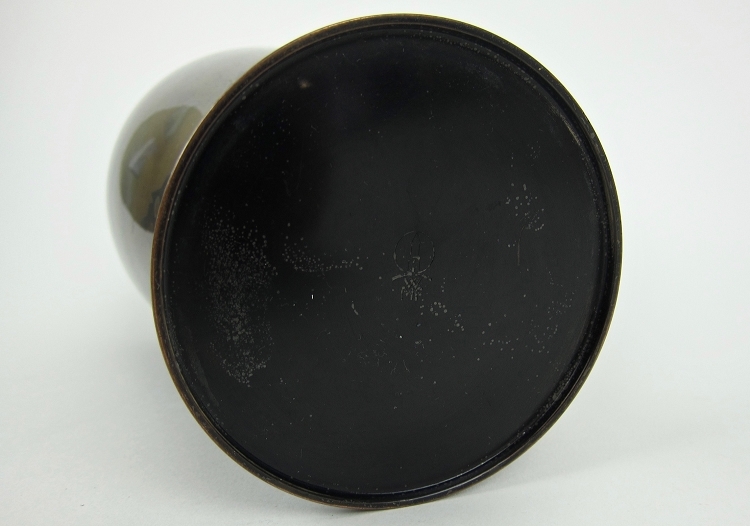 It is stamped underfoot with the company's Oden Tower mark (used circa 1925-1950). 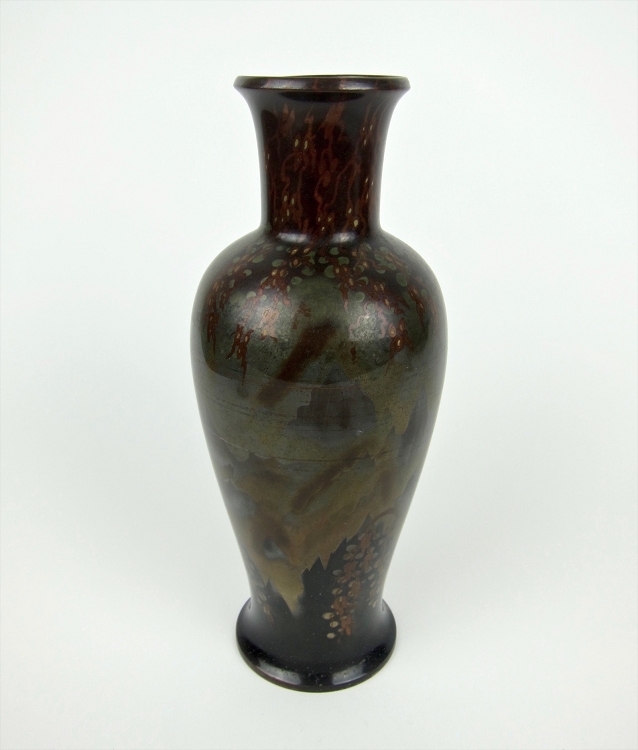 The vessel is in good condition, free from dings or dents, but the decoration shows wear that includes a four in. vertical scratch and a series of shallow, scuffed lines around the circumference.